Three little pigs set out into the world. One builds a house of straw. The second a house made of sticks. The third pig builds his house with bricks. 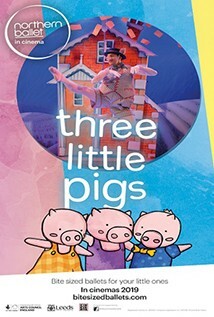 Then along comes a very hungry wolf... Northern Ballet’s Three Little Pigs hits the big screen in this interactive ballet for children. The story is read for the cinema audience by BBC’s Anita Rani and includes dance move demos for kids to try, by the professional ballet dancers. This bite sized ballet provides the perfect way to introduce young children to the artistic beauty of ballet in a comfortable, affordable, local family friendly setting. With playful characters and spellbinding music, this adorable ballet is sure to have your little ones dancing all the way home with excitement! 65m.